Truck drivers play a very important role in moving goods throughout Charlotte and the rest of the United States. Truckers need to have special licenses and significant training in driving large commercial vehicles in order to keep the public safe. Charlotte truck accident attorneys can provide legal representation to accident victims and work to hold truckers and trucking companies accountable when a truck driver fails to follow the rules or is careless and causes a collision. Unfortunately, trucking companies are having a difficult time finding qualified truck drivers. An increasing shortage of trained, qualified professionals leaves truckers to face extra work and trucking companies with unfilled shifts. This can lead to more fatigued driving collisions as truckers struggle to get all of the goods delivered, and it can lead to more crashes by inexperienced truckers. The truck accident attorneys at Brown Moore and Associates, PLLC can help to take legal action if you or a loved one is affected by a collision. According to Reuters, the trucking industry is currently lacking around 35,000 qualified truck drivers. The improving economy and rising consumer demand have left many trucking companies struggling to find qualified drivers to bring goods to market, and this problem is only likely to get worse. The American Trucking Association estimates that by 2020, the United States could be in need of approximately 240,000 truckers if something is not done soon to address the problem. The president of one company in the shipping industry indicated that he needs several thousand more drivers in the next year alone to operate his company’s fleet of 7,000 vehicles. He told Reuters that the company already has freight that cannot be delivered because they do not have enough drivers to meet the capacity. There are many reasons for the driver shortage, including demographic changes. The average truck driver is around 55 years old and many drivers are retiring. There are not enough young drivers who want to sign up to take their place. Trucking companies are offering bonuses as incentives, but many younger workers do not want to be away from home as a trucking job would require. Another explanation for the potential shortage is that the Federal Motor Carrier Safety Administration (FMCSA) recently imposed stricter limits on how many hours a trucker can drive each day and each week before he needs to take a rest break. While these limits may be putting pressure on trucking companies due to an inability to find drivers, they are very important for preventing collisions caused by fatigued truckers. If the regulations were not in place to limit trucker hours, the shortage could lead to employers pressuring their drivers to take longer shifts to get freight delivered. This could make the roads less safe. Compared to passenger vehicles, tractor-trailer trucks prevail significantly in size and weight. These differences can result in much more harm for those involved in an accident with a big truck. The additional weight and size can have devastating results, which can shatter lives and impact families for years to come. Being involved in an accident with a big rig and coming away with only minor injuries is very rare. Instead, the results are usually life-altering. Accidents with tractor-trailer trucks cause traumatic brain injuries, amputations, decapitation, disfiguring burns, permanent and severe scarring, and even paralysis. These are not injuries where someone can just walk away. Instead, these are injuries that impact your life in the years to come and can leave your family wondering where to turn. There are many causes for trucking accidents, but most often, they are caused by situations that could have been avoided. Yes, most big truck crashes could be prevented but still, they continue to happen. If the tractor-trailer driver is negligent and causes an accident with a passenger car, it can lead to devastating results. Those injured in a trucking accident can suffer the loss of a loved one or life as they know it is gone forever. If a Charlotte trucking accident has caused you to suffer, you deserve to be compensated for the physical, emotional, and financial burdens that have resulted from the truck crash. The size of the vehicle is intimidating. A semi can weigh 16 times more than a normal passenger car or as much as 80,000 pounds. The impact of a truck that size against a car can be devastating. Because of the size and design of a semi, a tractor-trailer needs about 350 feet to come to a stop if it is traveling at 60 miles per hour. This distance is farther than the length of a football field, so it is safe to say they can’t stop on a dime. Semi drivers have more difficulty avoiding road hazards such as debris and accidents because of the additional time and space needed to alter the course of travel. There are many big trucks out on the highways transporting explosive, flammable, or other hazardous loads. Hauling cargo like this can turn a minor crash into a major event that results in even more severe injuries and worse damages. Every year, there are about 500,000 accidents involving big trucks in the United States according to the U.S. Department of Transportation. Out of those, about 1% of them or 5,000 lead to fatalities. 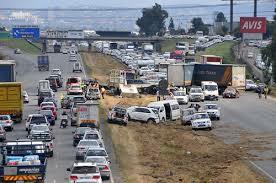 To paint the picture for you, one out of every eight traffic accidents in the country involve a big truck. Out of the fatalities from big truck crashes, 98% of those killed are in passenger vehicles, such as SUVs, sedans, or pickup trucks. Looking back to the statistics for 2008, 68% of the fatal truck crashes didn’t happen in cities but in rural areas and as much as 66% of the crashes took place during the day instead of at night. Back in 2003, the numbers reveal that 78% of all truck accidents happened on weekends. The numbers don’t lie. Your chances of being in a big rig crash in North Carolina are significant. There are countless reasons for trucking accidents or any kind of car crash, but the statistics for semi wrecks are actually somewhat alarming. One of the leading causes of trucking accidents in the country continues to be driving under the influence (DUI). And, nationwide, the majority of trucking accidents remained to be caused by the truck driver. Many times, the drivers do not adhere to the regulations for commercial drivers, and drive while they are too fatigued, which leads to a crash. Both of these settlements were from trucking crashes that injured people just like you. Our practice areas for trucking accidents include personal injury claims and wrongful death claims. We provide caring, compassionate service for our clients while aggressively pursuing the settlement they deserve to continue in life. When you call us to learn about legal representation for your trucking accident claim, there is no need to worry. We require payment upfront or charge exorbitant hourly rates. Instead, we work on a contingency basis. The better we do for you, the better we get paid. We get a set percentage of your settlement and you agree to that percentage when you retain our services. When we win your settlement, we get that percentage that we agreed upon. If we don’t provide results, you don’t pay us. It is as simple as that. Don’t wait to get legal advice. There is a statute of limitations to pursue a claim. If you have lost a loved one because of a trucking accident in Charlotte or elsewhere in North Carolina, contact our team to pursue a wrongful death claim for a trucking accident. If you suffered injuries in a crash, we will pursue a trucking accident personal injury claim. Dedicated legal help is only a phone call away. Call Brown Moore and Associates at 704-335-1500 locally or toll-free at 844-452-3688 for a free case evaluation.